Currently, there are a wide range of macro-level factors driving Toronto’s commercial real estate market. The balance of supply and demand is driven largely by the strength of the economy and job creation, which affects the demand for various types of real estate and office space trends. Current workplace trends in the office space design market are influencing the overall commercial real estate segment. For instance, organizations are redesigning work spaces to be more collaborative and have shifted away from private offices to more open environments, creating more employees per square foot in the facility. Additionally, trends in industrial space have shifted from lower-height manufacturing space to smaller incubator space for innovation and larger footprints in fully automated buildings with elevated ceiling heights for efficient distribution. located office, industrial and residential property into new efficient space has accelerated as the economy has recovered, property values have escalated, and populations have become denser. Yet, what happens to future supply and demand for Toronto real estate when macro-level factors are applied? How will real estate be impacted as: interest rates rise; residential property values decrease; recent non-resident buyer’s tax, residential rent controls and changes in small business tax rates influence the market; the cost of electricity increases; transportation methods shift allowing workers to commute or collaborate from remote locations; Amazon continues to shift the basis for distribution; the mix in the economy between manufacturing, distribution and innovation shifts; and changes occur in other jurisdictions affecting the relative competitiveness of the market? In anticipating where the Toronto economy and real estate market are headed in 2018, an ample measure of caution is required. Any single metric can be overshadowed by unanticipated influences: A rising real estate market can erase the negative implications of fundamentally “poor” real estate decisions. Likewise, a single or the cumulative impact of unforeseeable events and related risks can adversely affect the merits of a fundamentally “good” real estate decision. While commercial real estate brokers have the benefit of hindsight, real estate decisions going forward must be made with current local data, analysis and sound advice. 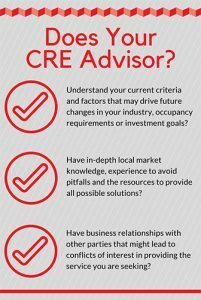 Real estate category managers will often benefit from working directly with advisors who are immersed in the local submarket and those who can propose creative solutions in both weak and strong markets. 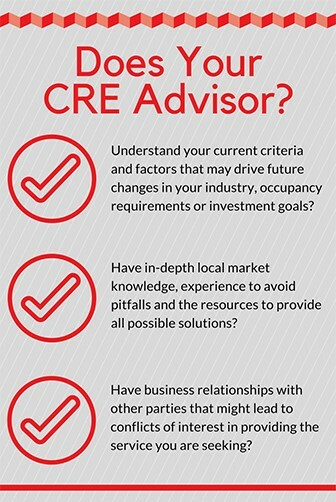 • Does the advisor understand my current strategic needs, as well as factors that may drive future changes in my industry, occupancy requirements, facility management, or investment goals? • Am I working with senior specialists with local market knowledge and experience to help avoid pitfalls? • Does the advisor have access to the right resources to provide the most reasonable set of potential solutions? • What other business relationship does the advisor have with other parties that might lead to conflicts of interest in providing the services needed? In recent years, real estate data has become a readily available commodity rather than a proprietary product from a real estate broker or advisor. However, integrity and local market insights of an experienced broker are key to providing value and helping clients evaluate optimal global real estate solutions.